Egyptian security forces have for years battled Islamist insurgents who have attacked Coptic Christians, tourists and security personnel. On Sunday evening President Abdel Fattah al-Sisi was due to inaugurate the Cathedral of Nativity in Egypt's new administrative capital, 45 kilometres (28 miles) east of Cairo. He said "extremists" had planted "an explosive device on the roof of Al-Haq mosque. near the Virgin Mary church". A mosque imam reported to authorities that a suspicious bag was left on the roof of the building. Egypt's president is inaugurating Nativity of Christ Cathedral for Coptic Christians and one of the region's largest mosques. Egyptian security forces have stepped up their presence outside churches and other places of worship ahead of New Year's Eve and Coptic Christmas, which is celebrated on January 7. "On this day we see you have fulfilled this promise and here we are witnessing a great opening on this grand occasion", the head of the Coptic church Pope Tawadros II said. The new church's capacity accommodates 8 thousand people, said Samuel Matias previously, adding that the cathedral will provide big buses to transport participants in the mass from Abbasiya to the New Administrative Capital, starting from 1 p.m. 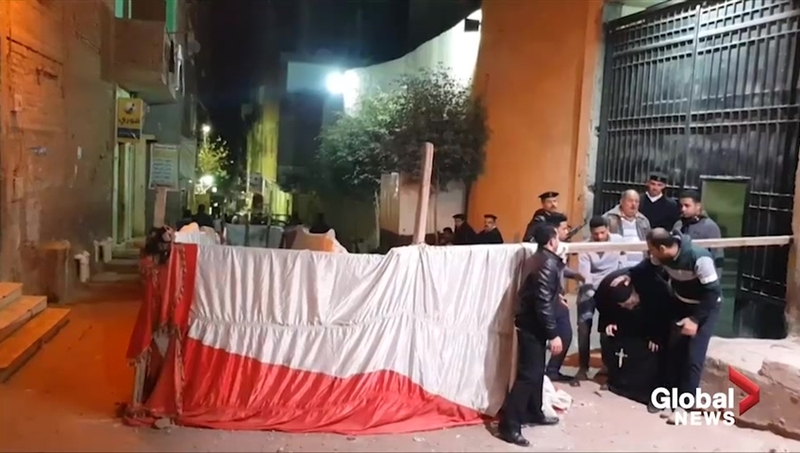 The jihadists killed more than 40 people in twin church bombings in April 2017, and an IS gunman in December that year killed nine people in an attack on a church in a south Cairo suburb. His attendance on Sunday will mark the cathedral's official inauguration.